Scarborough singer and actor Ben James-Ellis is joining Joe McElderry on his new tour Gloria which arrives in York later this year. Ben, who started his career at the YMCA in the town, found fame after his appearance in the ‘search-for-a-star’ show Any Dream Will Do. He went on to star in the West End in Hairspray with Michael Ball and Dreamboats and Petticoats which he also toured to the Futurist in Scarborough. He has also starred in pantomime. McElderry has been back in the studio recording his new album Saturday Night at the Movies out in July. The album includes hits from film and theatre featuring I’m into Something Good, Love is All Around, Daydream Believer as well as the new single Gloria. 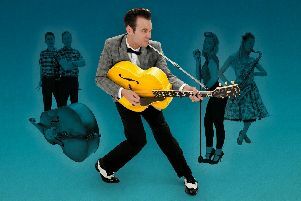 Number 1 and platinum selling artist Joe has already released four top 20 albums, two of which reached the UK top three. His debut single The Climb went to the top of the charts and was nominated for the Best British Single BRIT award in 2010. To celebrate the release of his fifth studio album Joe embarks on a nationwide live tour with songs from his new album, and more. Joe will also be joined on stage by special guests, X Factor’s Lloyd Daniels and Any Dream Will Do’s Keith Jack who, like Ben, was a runner up. It is at York Grand Opera House on Wednesday August 9.